Continuous band heat sealing utilise two endless belts that travel over hot heating elements. The two travelling belts allow heat to transfer through then sealing the thermoplastic, often a bag. The machines themselves tend to have a travelling conveyor that the filled bag is carried on whilst the top of the sack, bag or pouch travels through the dual belt whilst being sealed on the move. Techbelt offer endless, high temperature, heat resistant belts to perform this task that we manufacture in house. The belts we make are constructed by laminating two layers of PTFE coated glass cloths together, usually two layers of 0.08mm thick material, and off setting or stepping them. When the ends are brought together the offset ends marry together and allow the joint area to have virtually the same thickness of joint as the rest of the belt. The step at the ends is usually 25mm long. It is crucial the joint area is kept as near as possible to the same thickness as the rest of the belt. If this is too thick it may cause heat transfer issues resulting in poor sealing of the thermoplastic. 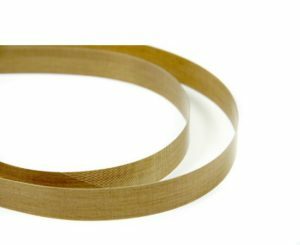 Our belts are made with a specified welding film issues via a works drawing to all laminate belt orders ensuring the correct thickness is achieved every time. We typically make the belts in sleeves that are 300mm wide by the length required then slit to the required width. Typical widths range from 12mm – 30mm wide.